Longitude: None at the North Pole! Yay, well done Ed and the rest of you! What an achievement, brilliant!! Congratulations [email protected] So glad that you made it there safely. Lottie will be really excited to see the photos tomorrow. Enjoy the moment! Heartfelt congratulations Ed, bloody good job! I have been eagerly checking for your update each morning here in NZ., Given the evidence of climate change you have witnessed, it is quite appropriate that you will be leaving the North Pole on Earth Day. Slainte, Colin. Brilliant achievement ed – well done! Just in case you’re still there, could you walk 10m South, 10m East and 10m North to show that the internal angles of a triangle don’t always add up to 180°?! Well done Ed and the team from everyone at Arch. You most feel on top of the world! Huge congratulations Ed, an amazing experience and achievement. Hope the journey South goes smoothly! #celebrateALLsuccesses particularly awesome ones like yours WOO HOOOO!!!! Well done Ed, from Philip and Lis at Glint Media. Come home safe!! Massive congratulations from Earthworks! Such an achievement. You should all be very proud. We will be celebrating at lunchtime here! What an amazing achievement. Well done Ed and the rest of the team. Well done wee brother, we look forward to the photos! Many congratulations Ed! A great personal achievement and a wonderful result for the charities you are supporting. I hope you have a smile on your face for a long time to come. Big hug. Great achievement Ed! Well done! I’m very happy for you! Enjoy the white lands whilst still there and have a safe journey back home! 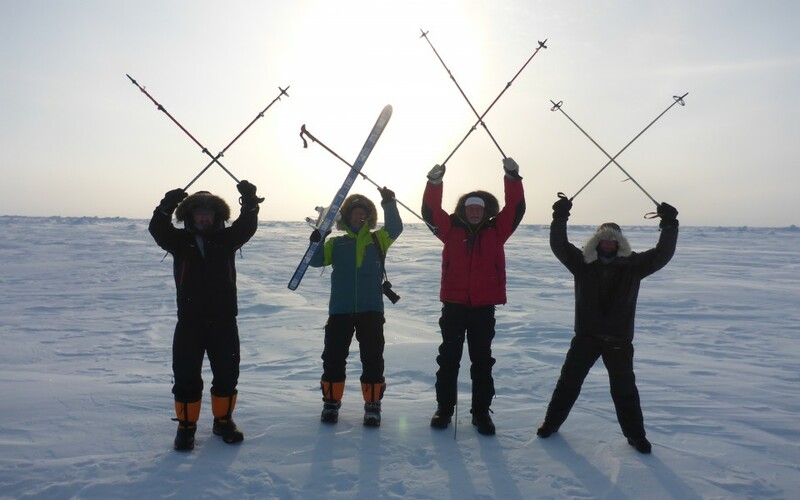 Congratulations Ed, from all of us at the UK Antarctic Heritage Trust! Massive congratulations Ed and Men in Mittens team! What a mighty achievement that can surely never be surpassed. I’m thrilled and delighted for you all and of course very grateful for the fantastic fundraising for Rennie Grove Hospice Care which will support so many patients. Wishing you well for a safe journey back to your family in the UK. Well done Ed – a truly magnificent achievement for you and and your team – really pleased for you and the charities you have worked so hard to raise funds for – looking forward to seeing the pictures!! Fabulous!! Congratulations!! Well done all what an achievement. Well done Ed! Great, great news and never a shadow of doubt in our minds that you would walk long, and safe. Terrific to know you are home. Love to all?